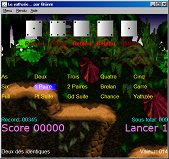 This page shows some of my old games for PCs. These are usually very small games. Also, the 'Hide' (cacher) feature was designed for my class colleagues (and me, but don't tell it ), that liked to play during courses but didn't want to get trapped by the teacher. The special combination to make the window appear again is Ctrl+Win+B. 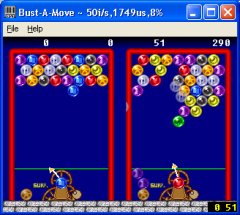 A simple demo of a Puzzle Bobble-like game with an integrated AI (the second player plays on your right). Programmed in Visual Basic, and thus you may need the Visual Basic runtimes to make it work. You can download the required DLLs somewhere on the web, just google for them ;) You'll then have to copy it to your \windows\system32 folder. Put this on your local C: drive (the folder will be C:\Mario\). It's the only way to make it work as paths are hardcoded. The keyboard configuration is directional keys and numpad 1 and 2. 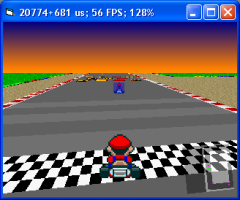 A demo of a small Mario Kart-like game with a software rendered Mode 7. Programmed in Visual Basic, and thus you may need the Visual Basic runtimes to make it work. You can download the required DLLs somewhere on the web, just google for them ;) You'll then have to copy it to your \windows\system32 folder. Important: Put this on your local C: drive (the folder will be C:\Mkart\). It's the only way to make it work as paths are hardcoded. A Connect 4-like game with an integrated AI for 13 players (you can choose between them) which are famous video game characters. Each character's AI behaves different. 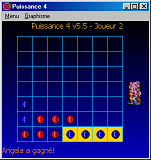 A snake-like game. 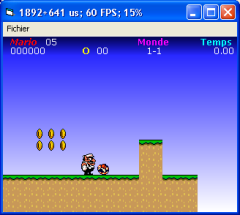 One of my first PC games.